Introducing the Cowboy Professional Marfil Western Wedding Boot Collection, a hand crafted masterpiece built for comfort and durability. 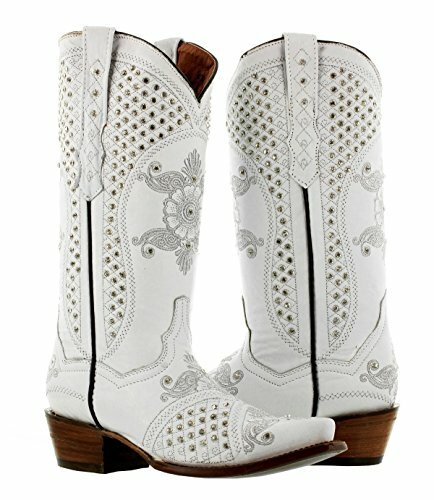 Along with an elegant rhinestone finish, this is a must have boot for any cowgirl. These boots feature genuine leather shafts & uppers (vamps), welt stitched full leather soles that are reinforced with wood pegs and solid brass nails for durability. Stacked leather heels, full leather linings, and our Cushion Comfort Sole System (CCSS) deliver maximum comfort. If you have any questions about this product by Cowboy Professional, contact us by completing and submitting the form below. If you are looking for a specif part number, please include it with your message.